Add the perfect decorative accent to your traditional styled kitchen or bathroom cabinetry with the Liberty 1-1/4 in. Round Knob with Square Base. With its classic design and rich Bronze with Copper Highlights finish, this knob is sure to be enjoyed for years. This knob includes mounting hardware for a quick installation. Make a bold statement with the Global Retro knob from Liberty Hardware. Inspired by the clean geometry of midcentury modern design, this knob features vintage style in a contemporary interpretation. Ideal for both kitchen cabinetry or furniture use. Bold lines pair with a classic shape to give the Webber Knob by Liberty Hardware the look of timeless elegance. The soft square design is bold yet classic. Ideal for traditional or transitional décor in your kitchen or bathroom. The Liberty 1-1/4 in. Black Chrome Round Knob adds the perfect finishing touch to your cabinetry. The high-quality die cast zinc base material with its glossy black finish will update the look of any room's decor. Uses 8-32 x 1 in. machine screws. The Liberty 1-1/4 in. White Birch Round Knob can give you the rustic look you want for your cabinet. This wooden knob can be used for cabinets and is compatible with standard 3/4 in. drawer fronts and cabinet faces. Also included is #12 x 1-1/4 in. pan-head Phillips tapping screws for easy rear-mount installation. Westbrook Knob Add the perfect decorative accent to your traditional styled kitchen or bathroom cabinetry with the Liberty 1-1/4 in. Round Knob with Square Base. 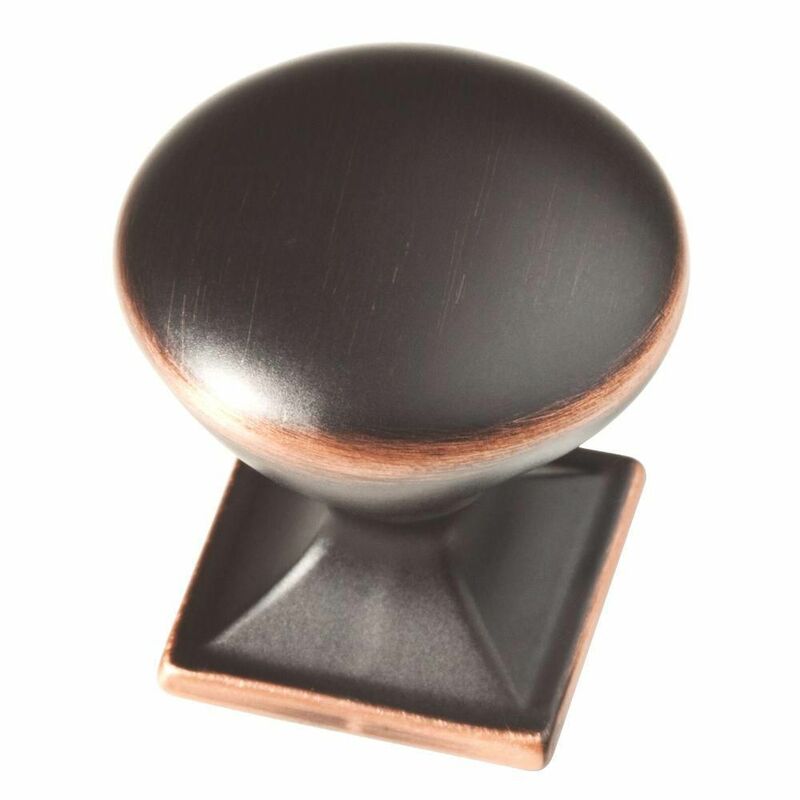 With its classic design and rich Bronze with Copper Highlights finish, this knob is sure to be enjoyed for years. This knob includes mounting hardware for a quick installation. Westbrook Knob is rated 4.7 out of 5 by 21. Rated 4 out of 5 by Andre from A good solid weightiness to the item. Not some cheap... A good solid weightiness to the item. Not some cheap imitation. Strong and of good quality. Will last for years to come. Rated 5 out of 5 by HomeDepotCustomer from I purchased these to replace hardware on a mission/style cabinet.Perfect... I purchased these to replace hardware on a mission/style cabinet.Perfect choice! Rated 5 out of 5 by LHC from They complete our kitchen perfectly!... They complete our kitchen perfectly!